Undoubtedly, everybody has their own idea of how a temporary website shutdown would look like. If you’re a novice blogger, whether people can or can’t see anything on your site during development might not impact you. Thus, you may simply turn off your site until it’s ready to launch again. However, if you’re on the internet to do serious business, you might not have the luxury of keeping the site shut completely. You must communicate something to your customers in the context of shutting down. And, it can be effortlessly done with the help of a WordPress coming soon page. Ideally, this may help you obtain their email addresses or provide some coupons to reprimand the inconvenience. Overall, the reasons behind temporarily disabling the website may vary. So, for the curious visitors, an engaging coming soon page would suffice. This post is all about setting up a coming soon page and how you can take advantage of it. What Is a WordPress Coming Soon Page? A coming soon page is a precise statement of intent before you make the website live. It provides vital information to your visitors about the sites under construction and let them know the estimated time by when your website is going to be back in action. Moreover, you can also find ways to generate leads through this page and enhance your search engine ranking through adequate optimization. What’s more, if you use the right set of tools, setting up this page can become an easier task for you. Obviously, there is an array of methods that you can use to implement this page on your WordPress website. However, by far, the simplest and most effective one would be by using a relevant plugin. If you’re not sure of how interested your target audience is in your business, a coming soon page can help you gauge the same. By allowing visitors to leave their email IDs behind so that you can notify them whenever the site is back on track is a great way to figure out whether your customers are interested in your brand or not. An engaging and attractive coming soon page can also be used to develop anticipation and hype amongst the target audience. To do so, you can display your upcoming products’ information on the coming soon page and provide incentives to the audience for sharing it. With just a bit of effort, it can work wonders for you. By acquiring their email IDs, not just you can notify them about the website being life again but can also increase your email list. And then, you can use the same data for email marketing. Since visitors would be submitting their IDs on their own, it simply means that they’re interested in your products. You can leverage this situation and convert them into happy and satisfied customers. When Do You Need a Coming Soon Page? Throughout the website handling journey, you’re going to come across several such instances when disabling the website might turn out to be a better option. However, it’s necessary to understand all of these situations beforehand. If you’re already prepared with what you can expect from your website and to handle the procedure, you’ll be more confident when it comes to running a site. This plugin by Niteo Themes provides varied advanced features that you can avail for free. It comprises three different pre-designed responsive Coming Soon themes that you can edit on the settings page of the plugin. You can also customize the background image, change fonts and colours, and add custom CSS code according to your requirements while developing a coming soon landing page. Apart from default themes, this plugin also comes with a number of premium themes from where you can choose the best one. If you wish to use this plugin without paying anything, then you can download it from the WordPress repository. However, if you wish to use the premium themes, you’d have to pay $10/theme. 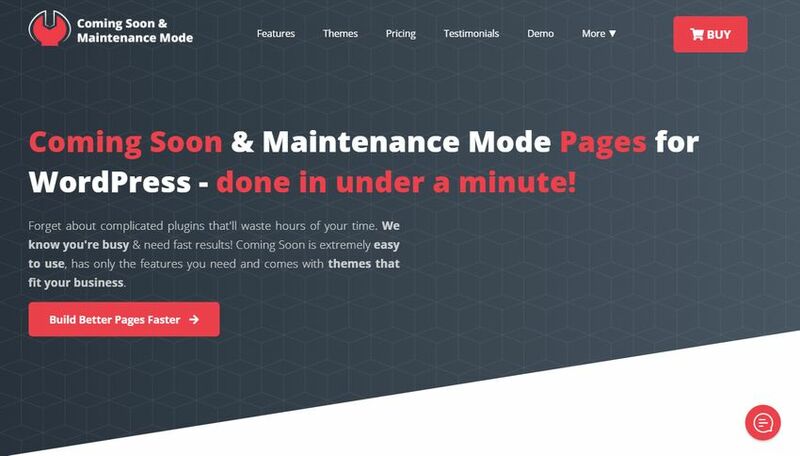 With this specific plugin, not just you can create professional Maintenance Mode and Coming Soon page but launch and landing pages as well. Its free version will be an ideal choice for you if you wish to set up a striking coming soon page quickly. You can customize the design and configure your favicon, logo, fonts, colors, background image, and much more. On the other hand, the pro version allows you to access 70+ pixel-perfect and easy to edit Coming Soon themes. This version also provides advanced SEO analytics tool that you can use to assess your page on the basis of more than 30 SEO signals. And then, its drag and drop, the user-friendly interface would be enough to help you create a good design. The free version can be acquired from WordPress.org. And, the pro version is going to cost you $29/year. If you wish to have a lifetime license, you’d have to pay $79 for one website and $199 for unlimited websites. Undoubtedly, Supsystic has provided several professional WordPress plugins to the world. And, this Coming Soon being one of them. Its free version allows you to create and set up gorgeous Coming Soon page on the front-end so that you can seamlessly work on the back-end of the website. Supsystic has ensured that even if your website is under the construction mode, it can still be open for search engines. In its free version, you can also select from two different pre-designed Coming Soon themes. On the other hand, its pro version offers nine themes that are responsive across devices as well. Furthermore, these themes can be customized through a drag and drop interface on the front-end. And, along with a coming soon page, you can also generate a WordPress under construction page with this plugin. While the free version can be taken from the repository of WordPress, you’d have to pay at least $29/year to use its pro version. The plans might differ as per your requirements. With this specific plugin from SeedProd, you can seamlessly create a striking Coming Soon page just within the matter of a few minutes. The free version of this tool is quite famous with more than 800,000 active installs. Setting up this plugin is also an effortless task. You wouldn’t require any programming knowledge. Pages of this plugin are also responsive; hence, they can work perfectly across devices. Although its free version can help you develop a decent page, however, if you wish to have advanced features and functionality, you can rely on the Pro version. It provides you access to real-time page builder, several free background images, third-party integrations, Google Fonts, and much more. The free version can be downloaded from the WordPress repository, and the premium plans start from $29.60/year. The launcher is one of the most considerable WordPress coming soon plugins that you can use to fulfill your basic coming soon or maintenance mode requirements. This one is a lightweight tool and provide three varied templates, social media icons, advanced counter, front end editing, subscription form, and inbuilt contact. What makes this plugin stand out from the rest of the options is its minimalist and modern design that not only seems to be visually appealing but can also fulfil the requirements of different WordPress websites. Being completely responsive, it allows your visitors to see the website on almost every other device. Additionally, this plugin also supports different plugins, like MailChimp, Aweber, Campaign Monitor, and more. This one plugin is completely free, and you wouldn’t have to pay a single penny to use it. All you’d have to do is download and begin the setup. 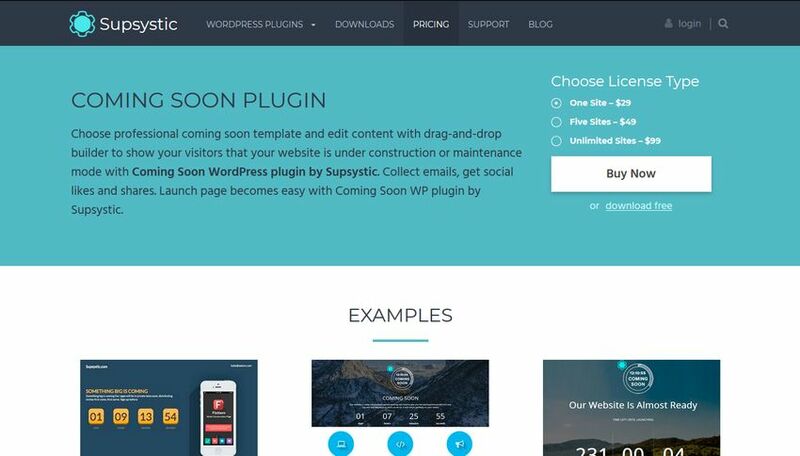 How to Create a Coming Soon Website Page Using WordPress Plugin? Now that you’re familiar with some of the best options in the Coming soon page plugin category, now is the time to get your hands dirty with the work. Once you’ve selected a plugin, you can begin the process by installing it on your WordPress website. For this, log into the admin dashboard of the website, navigate to Plugins, and click on Add New option. There, you can enter the plugin name and install it. Once the plugin is installed and activated, you can access it from the option available in the Settings on the sidebar menu. After that, the process of creating a coming soon page would become quite easy. From the Settings tab, you can activate the option for coming soon page. And then, that page will be visible to all of your non-logged visitors. If your plugin supports free themes, you can use them as well to provide an appealing touch to the entire page. Furthermore, in the Settings tab of the selected plugin, you can also customize your coming soon page or a maintenance mode page. You can choose an appealing font, bright colours, set a background image, and also add your company’s logo on the page. If you want more and your plugin allows you to do the same, you can also add your social media profile icons so that your visitors can directly follow you there. Apart from that, customize the page as and however, you’d like to. However, make sure that it’s pleasing and compels visitors to return. Creating a coming soon landing page for your WordPress website is obviously one of the most considerable ways to build anticipation among people and generate leads even before your website goes live. By adding one such page to the website, you can provide essential information to your visitors and can also optimize the page for search engine rankings. In this post, you got to know about the advantages of having this page, plugins that can help you, and how easily you can create a coming soon page for your visitors. Now is the time to take the plunge and get into the action. If you have any doubts or know about any adequate plugin that can help develop a WordPress coming soon page, do let us know in the comments section. Leadpages, OptimizePress, or ClickFunnels – Which is the Best Landing Page Builder? Whether you want to create a landing page for your project, or a mini website that takes your visitors through a sales journey, Leadpages, OptimizePress and ClickFunnels are three of the best tools on the market. Regardless of whether you already have a website or not, by using one of these tools you could have a highly effective landing page (or sales funnel) up and running in just a few hours. But, when it comes to these three page builders, which is best? Which one should you choose? These are the question we’ll be answering in this article. So, if you’re looking to create that all-important high-converting landing page for your site, read on. What Can These Tools Do? The main goal of Leadpages, OptimizePress, and ClickFunnels is to allow you to create high-converting sales or landing pages to promote offers to your audience. Physical and digital products, services, events such as webinars, invitations to join your email list, or any other offer you can think of can be promoted with the right type of landing page. To help you to create the perfect landing page for your project, Leadpages, OptimizePress, and ClickFunnels include fully customizable templates. You can also split test your landing pages to find the designs that work best with your audience and the offer you’re promoting. OptimizePress, Leadpages, and ClickFunnels all integrate with payment processors and auto-responders, helping you to create a seamless user experience from a prospect’s initial visit to your page through to completion of a payment or subscription goal. So, if you’re looking for a powerful tool to improve your conversion rates — whether you’re promoting your own products, acting as an affiliate, or offering some other opportunity to your audience — Leadpages, OptimizePress and ClickFunnels have been built specifically for this purpose. But which one’s the best? In this guide, we’ll explore their strongest features and different approaches to help you to decide which of the three is the right option for you. Leadpages is a popular landing page and lead generation tool that provides you with everything you need to create custom sales pages. This 404 error page is just one of the many Leadpages templates that can help turn visitors into leads. As the landing pages are hosted on the Leadpages servers, you don’t need your own website to start generating leads or sales for your project. However, you can publish the pages on your own website — either by uploading them to your web space or by using the WordPress integration plugin. An example of one of the editable Leadpages landing pages. To help you get started, you can choose to take a quick questionnaire covering your reasons for using Leadpages. Templates matching your goals are then displayed, ensuring you can quickly find the right design for your landing page or mini site. Leadpages provides a range of recommended templates aligned to your goals. You can also easily browse all 200-plus Leadpages templates with the option of filtering them by category. Leadpages aims to help you to quickly find the templates most closely related to your goals. Unlike ClickFunnels, where you can only view templates related to the type of funnel you’re creating, Leadpages makes it easy to see everything that’s available in one place. Another of the sales page templates in the Leadpages library. Considering the high quality of the designs, it’s not hard to see why Leadpages is eager to show off its templates. As well as allowing you to search the template library, another nice feature of Leadpages is that the templates are sorted by highest conversion rate, listing the most effective options first. As well as helping you to create landing pages, Leadpages also enables you to produce optin forms. These optin forms can be added to your Leadpages landing pages or inserted into your regular website content. Optin forms can be used to grow your email list or encourage visitors to opt into some other offer. Your optin forms can be activated by the exit intent triggers and timers, as well as by clicks on the plain text, button, and image links. Leadpages offers many of the features provided by the best lead generation plugins and services. As with the landing pages, the optin forms are fully customizable through the drag-and-drop editor, and help to make Leadpages a good alternative to email optin plugins such as OptinMonster, Bloom, or Thrive Leads. The form actions let you define what happens after a user has opted in, including automatically emailing a file or link to the new subscriber. As well as customizing the appearance of your forms, you can also control what happens when a user opts in. Then there’s the Opt-In Texts tool, also known as Leaddigits, that lets visitors optin via mobile phone text messaging, while the Leadlinks Trigger Links feature can be used to sign up visitors in one click rather than through a form. The Leadlinks Trigger Link tool can be used on your website or in emails to enable someone to subscribe simply by clicking a link. Unlike with ClickFunnels and OptimizePress, you cannot purchase additional templates for Leadpages. Instead, you get access to all of the 200-plus templates as part of your account, regardless of which Leadpages plan you choose. The Leadpages designs are also organized according to whether they’re drag-and-drop templates that are compatible with the newer editor or the older standard templates for use with the legacy editor. Whether you choose a drag-and-drop landing page template or a standard design, you get access to a useful set of customization options with Leadpages. This may not have been the case in the past, but the latest version of Leadpages comes equipped with a modern point-and-click page builder. The drag-and-drop landing page templates can be fully customized through the Leadpages editor. The Leadpages drag-and-drop editor lets you click on any text in the template to start editing it. The context-sensitive controls make it easy to find the settings for the item you’re working on. Clicking on a page element helpfully displays the controls for that element in the sidebar. Whether you start with a blank canvas or load an existing template, you can easily add new sections to your page and then customize their appearance. Widgets can be inserted into the sections to build your custom landing page. Once you’ve added a widget to your page, you can then customize it through the WYSIWYG interface. If you choose one of the standard templates, then the customization work takes place through a different editor. Although the standard template editor isn’t as user-friendly as the drag-and-drop version, you still get a lot of control over the design of your landing page. Some of the Leadpages templates are classified as standard templates and are customized through a different editor. However, another benefit of using the drag-and-drop templates is the Leadmeter feature that has recently been added to the newer editor. If you’ve chosen a template which supports the Leadmeter, clicking on the Leadmeter button evaluates your page to see how well optimized it is, with advice on what you can do to improve it. The Leadmeter tells you how well optimized your page is and how it can be improved. When your page is ready, it can be published as a standalone page hosted by Leadpages with its own URL, added to your Facebook page in its own tab, or downloaded so you can host it on your own web space. WordPress users can also use the Leadpages plugin to display the landing pages on their website. The Leadpages plugin makes it easy to use the landing pages on your WordPress website. The Leadpages drag-and-drop editor has been steadily improved and is now as intuitive and functional as the ClickFunnels editor. Although the legacy editor that you can use to customize the older templates in Leadpages is definitely not as user-friendly. However, like the ClickFunnels editor, the Leadpages drag-and-drop editor is more impressive than the OptimizePress editor. With Leadpages, your landing page views and conversion rates are automatically tracked. Leadpages also integrates with third-party tools, such as Google Analytics. This could be useful if you need more data or are planning to add the landing pages to your existing website, and are already using this tool to track your visitor activity. Leadpages provides basic performance reporting, but you can integrate your pages with Google Analytics for more detailed data. Running split tests to optimize your landing pages is very easy with Leadpages — provided you’re on the Pro plan or higher (but not the entry-level plan). You can create multiple variations of a page, and then choose how traffic is distributed among the variations until you’re ready to declare a winner. Testing your alternate design with just a small percentage of your traffic is easy with Leadpages. Like ClickFunnels and OptimizePress, Leadpages integrates with all of the most popular relevant services, including email marketing tools, webinar services, payment gateways, and WordPress. Integrations with services such as Hubspot and Salesforce are reserved for those on the top-tier Advanced plan. Just some of the Leadpages third-party integrations available. By connecting your Stripe account to your Leadpages account, you can add checkouts to your pages and collect payments on your site. Standard: $37 per month (or equivalent of $25 per month if paid yearly). Pro: $79 per month (or equivalent of $48 per month if paid yearly). Advanced: $321 per month (or equivalent of $199 per month if paid yearly). As this is a hosted service, you need to maintain your subscription to keep your pages online (unless you download a design and upload it to your own web host). Therefore, you may want to take advantage of the reduced prices available to those paying for two years upfront. Although there are some differences between the three Leadpages plans, all users get access to all 200-plus templates, and the ability to create as many pages as they want for an unlimited number of visitors. Unlike ClickFunnels, there’s no cap on leads and visitor numbers. Upgrading to the Pro plan unlocks features like the split testing tool, text message optins, and one-click signups. Those on the top-tier Advanced plan get access to extras like 50 extra optin text campaigns, a 1-on-1 quick start call, and access to the Leadpages virtual workshops to help improve your marketing skills. There is a 14-day Leadpages free trial available. It does require a credit card, but you should have enough time to explore Leadpages before your card is charged. Leadpages has high-quality landing page templates and a very usable drag-and-drop content editor, so, whether you’re looking for ready-made landing page designs or you have your own vision for your sales pages, this tool is a solid option. The Leadboxes optin form feature and the ability to publish Leadpages landing pages on a WordPress website are two more reasons to recommend this tool. The reporting features are a bit basic, but the Google Analytics and Facebook Pixel integration, along with the split testing tool, should provide you with all the data you need to optimize your landing pages. All this makes Leadpages a powerful tool. However, as we’ll soon see in this comparison, the inability to create multi-step funnels may make another tool in this article a better option for you. OptimizePress is a landing page and lead generation tool for WordPress websites. Previously delivered in both WordPress theme and plugin formats, after a recent update only the latter version is now available. However, there is an optional OptimizePress SmartTheme you can add to your site for extra functionality. While OptimizePress should work with most WordPress themes and plugins, there are some compatibility issues to be aware of. One of the customizable OptimizePress landing page designs. So, if you’re already using WordPress or you’re prepared to start a new WordPress site, OptimizePress could be the tool to help you create sales and landing pages, as well as pages for your membership site, webinars, and product launches. Unlike the ClickFunnels and Leadpages hosted services, with OptimizePress, all the action takes place in the dashboard of your WordPress website. The OptimizePress control panel within the WordPress Dashboard. Once the plugin is active, you can watch the introduction video to get started or begin work on a new page. The fully customizable OptimizePress pages are divided into six main categories, including optin and landing pages, sales pages, thank you pages, and pages for webinars and delivering membership site content. Some of the OptimizePress landing page templates. The OptimizePress templates look good, but they’re not quite as impressive as the designs from Leadpages or ClickFunnels. The OptimizePress landing pages are designed to generate subscribers for your email list. While the OptimizePress landing pages are focused on helping you to grow your email list or collect contact details from your visitors, the sales page templates have been designed to elicit a purchase from your audience. The OptimizePress sales page templates feature more content than the landing page designs. The OptimizePress templates are usually focused on a specific goal, but they’re fully customizable, so they can be adjusted for a range of purposes and outcomes. One of the OptimizePress sales page designs. Unlike Leadpages, there’s no conversion rate information about the OptimizePress templates, so you can’t sort them to find the most effective designs. But, like ClickFunnels, you can purchase additional templates for OptimizePress from their marketplace (although at the time of writing, the marketplace was down for maintenance). Additional templates can be purchased from the OptimizePress marketplace. Once you’ve chosen a template, it opens in the OptimizePress LiveEditor for customization. The OptimizePress landing page editor. The OptimizePress LiveEditor definitely isn’t as slick as the ClickFunnels and Leadpages editors, or even those of some of the best WordPress page builder plugins, and is starting to look quite dated. However, it is functional enough. A lack of inline editing and no option to instantly see the effects of your changes does slow things down. Altering an element involves clicking on the edit icon, then making changes through a popup panel, rather than being able to work through a sidebar panel or type directly into the page as you can with Leadpages and ClickFunnels. OptimizePress makes it easy to enhance your pages with its library of elements. You can add a good selection of elements to your pages with OptimizePress, including audio and video players, buttons, countdown timers, optin boxes, pricing tables, testimonials, and much more. The Publisher and Pro licenses (but not the entry-level Core license) include the PlusPack elements, making it possible to add product showcases and sliders to your pages. Google Analytics and other tracking code can be added to your OptimizePress pages via the plugin dashboard. Pro and Advanced license holders can access the OptimizePress Experiments features via the PlusPack module, which includes the split testing tool. Using the OptimizePress Experiments feature, you can run split tests on your pages to find the highest-converting designs. With the OptimizePress Experiments module, you can compare two or more designs with an optin or page visit goal. The process isn’t as user-friendly as ClickFunnels and Leadpages, though — instead of everything taking place in one location, you must switch screens to make changes to the pages you’re comparing. Nor can you define how traffic is distributed among your pages as you can with Leadpages. The feature is functional, though, so you will be able to effectively test and compare your designs with OptimizePress. Payments for your OptimizePress membership content can be collected through a number of gateways. OptimizePress integrates with all the main email marketing services to help you grow your subscriber list. You can also use the Stripe and Gumroad integration to take credit card payments via order forms on your OptimizePress pages. The OptimizeMember module gives you the ability to add free and paid membership plans to your site. The OptimizeMember module, available on the Publisher and Pro pricing plans, is designed to protect content on your site and sell access via the payment gateway integration. Core: $97 for use on up to 3 websites. Publisher: $197 for extra features and use on up to 10 websites. Pro: $297 for all Core and Publisher features, and use on up to 30 websites. Unlike Leadpages and ClickFunnels, the price of OptimizePress is a one-time fee, although you will need to pay $39 each year to retain access to support and updates. Also, there’s an additional membership package that’s presented as an upsell after purchasing OptimizePress. Paying this monthly fee gives you access to more landing page templates and the OptimizeLeads lead generation and list-building software. Although there’s no free trial, there is a 30-day money back guarantee. OptimizePress isn’t as slick or feature rich as Leadpages or ClickFunnels, but it is a lot more affordable. The lack of subscription pricing may make it a good option if you’re on a budget, although you will need to pay for web hosting and manage your own WordPress website. You do get access to a good selection of page templates, and the LiveEditor does give you the ability to customize the prebuilt designs or create your own, but ClickFunnels and Leadpages have a lot more to offer. Also, as OptimizePress is a WordPress plugin rather than a hosted service, it’s up against some pretty strong competition in the WordPress page builder space, including Visual Composer, Beaver Builder, and Thrive Content Builder — to name just a few. ClickFunnels offers professional-looking landing page creation software, focusing on helping you to create funnels that take your prospects through a multi-step, predefined journey from initial interest to your final goal (such as product purchase). One of the pre-defined sales funnels available to users of ClickFunnels. Compared with Leadpages and OptimizePress, ClickFunnels is more of an all-in-one solution. As is the case with Leadpages, you don’t need a website as the landing pages are hosted on the ClickFunnels servers. However, if you do want to insert the ClickFunnels landing pages and optin forms on your website, doing so is very straightforward. ClickFunnels also has the ability to process payments and manage communication with your email list (although you will need to integrate with an SMTP service to send emails). ClickFunnels includes prebuilt customizable landing page templates for a range of promotions. ClickFunnels is probably the most feature-rich option in this landing page service comparison, but it’s also the most expensive. Let’s explore the best features of ClickFunnels to help you decide whether it’s a worthwhile investment for your project. Before you get to the library of landing page templates, ClickFunnels gives you the opportunity to choose from a selection of predefined sales funnels. Each funnel has been designed for a specific purpose and will help you to promote products, events, your email list, an online form, and webinars, to name just a few. ClickFunnels includes a good selection of pre-defined sales funnels for a range of promotions. Each funnel is accompanied by an instructional video to help you get the most from it. You’re also free to create your own funnels or purchase third-party funnels from the marketplace. As well as choosing from the predefined funnels, you can also create your own sales journey with ClickFunnels. Once you’ve chosen a predefined sales funnel or built your own, you can then move on to choosing a template for the landing page and other steps in the journey. The template selection is relatively small compared with that of Leadpages, and while there are some good designs, overall, they’re not as visually appealing. However, in addition to the included templates, you can also choose from a selection of paid designs. ClickFunnels offers free and premium purpose-built landing page templates. It’s good to have more choice, but, considering the relatively high price of ClickFunnels, it was a bit of a surprise to see $297 templates being offered inside the software. Despite giving you the ability to create complex sales funnels, ClickFunnels makes it easy to manage them. Once you’ve chosen a funnel and template, you can start the customization work. As well as editing the steps in the funnel, you can also launch the editor to work on the landing page templates. The ClickFunnels landing page editor is intuitive and well designed. The ClickFunnels landing page editor is very impressive. Simply click on a page element to start editing, and, thanks to the WYSIWYG interface, you can edit the content directly on the page with a live preview of your design as you work. The WYSIWYG editor makes the ClickFunnels design process streamlined and intuitive. To help you to create a custom landing page, template elements can be dragged and dropped into new positions. Clicking the settings icon for a page element opens up a side panel containing the appearance-related controls. Almost every aspect of your landing page can be customized through the user-friendly ClickFunnels interface. As the templates are fully customizable, you can easily add new rows and sections to your pages, and then populate them with elements from the ClickFunnels library. ClickFunnels includes useful elements to help you to create feature-packed landing pages, whatever your goals. Whether you simply want to replace the template placeholder text and images with your own content, or get more creative and redesign the whole page, ClickFunnels makes it easy. Once you’ve finished customizing a template, you can return to the funnel page to work on the rest of the user journey. ClickFunnels gives you easy access to the stats for your funnels. Through the funnel dashboard, you can view the success rate of each step in the user journey. Being able to see how well each stage in your funnel is performing gives you the ability to try to improve poor converting pages, and learn from any that are doing well. ClickFunnels provides the data and tools to help you evaluate and optimize your funnels and their pages. Setting up split testing in ClickFunnels is easy, too. At any point in the funnel, you can create a variation of a page and then either edit a clone of the original or create a new design based on another template. All this takes place on one screen, so you have easy access to everything you need. Although ClickFunnels provides lots of the features you would need for a sales journey, such as web hosting, email list management, and membership site functionality, it also integrates with an impressive number of third-party services. As with Leadpages, you can also display the pages from ClickFunnels on your WordPress website. ClickFunnels makes it easy to display its pages on your WordPress website. All the major payment gateways and processors, as well as many lesser-known options, can be connected to your ClickFunnels pages. You can also integrate your sales funnels with many email marketing and communication services as well. ClickFunnels: $97 per month (supports 20 funnels, 100 pages, and 20k visitors a month). ClickFunnels Etison Suite: $297 per month (supports unlimited funnels, pages, and traffic plus more features). As well as letting you create more content and handle more visitors, the ClickFunnels Etison Suite plan also includes the Actionetics autoresponder tool and the Backpack affiliate marketing system. Discounts are available for paying annually. You can compare the differences between the two plans on the ClickFunnels pricing page. As with Leadpages, there’s a free trial available, although you must enter your credit card details to sign up. However, the 14-day trial period does give you enough time to evaluate ClickFunnels before your card is charged. With a good selection of customizable landing pages and predefined sales funnels for promoting a wide range of offers, ClickFunnels is the all-in-one hosted landing pages solution with the most to offer. However, overall, Leadpages users get access to more high-quality landing pages, with the added bonus of not having to pay extra to access all of the templates. The ClickFunnels template editor compares well with the Leadpages editor. The ClickFunnels recurring pricing options are more expensive than Leadpages and OptimizePress. However, if it’s within your budget, you’re serious about growing your business, and you don’t want to miss out on any features, ClickFunnels is probably the best landing page builder solution. Final Thoughts: Which One Should You Choose? So now you know what these three tools can really do, which one should you choose? ClickFunnels is the most powerful tool here, and, if you can afford the fees and will use the main features, it’s probably going to have the biggest impact on your business. However, while it’s the funnels functionality that sets ClickFunnels apart from the competition, it may take you a while to master this aspect of the software. On the other hand, if you’d prefer a tool that’s very easy to pick up and still has a useful set of lead generation features, then Leadpages may be the best option for you. OptimizePress is the most affordable option, although you will need your own WordPress website. And, while on paper it has a good feature list, in reality, it’s not up there with ClickFunnels and Leadpages in terms of template design, usability, and capabilities. It’s still a powerful tool for those on a budget, though. If you’re concerned that you may not be able to get the most out of these tools, don’t worry. They’re all well supported with lots of online training materials, including written guides, videos, webinars, and responsive support staff. OptimizePress, Leadpages, and ClickFunnels are all powerful tools for generating leads and increasing conversion rates, so, whichever one you choose, you’ll be taking a step in the right direction when it comes to growing your business. Using or used Leadpages, OptimizePress or ClickFunnels? Thoughts? WordPress is largely based on a multiple page layout schema, which wasn’t typically the case. When WordPress was first launched, it was only a blogging platform. Nowadays, it is actively being utilized for enterprise needs, and many businesses have transitioned their digital presence over to WordPress as well. Business websites, portfolios, and agency-related web pages are typically run on a landing page, or strictly business style, theme. But in some cases, you see WordPress run websites with only one page. One-page websites have no fluff of additional pages — what you see is what you get, everything within a single page. Product-based businesses can greatly benefit from one-page themes, as they allow for product owners to focus only on one thing: to explain the product thoroughly, and get the visitor to convert into a customer. They’re also great for graphic designers or other creative artists, because they solely focus on getting the visitor from the top of the page, to the bottom; and whatever happens in the middle is the key focus point for any visitor. We have covered some brilliant free one-page themes for WordPress, but at the same time we’d like to encourage you to take a little bit of your time, and explore our other roundup: best premium one page themes for WordPress! That collection has more choices than what we have gathered here, and those themes have a higher chance of having the type of a design that you’d wish to use on your professional business website. Illdy is a mesmerizing multi-purpose WordPress theme built with the Bootstrap 3 framework. Its design is pristine, and easily competes with some of the best premium themes in the market, needless to say. It is our very own theme, and we take pride in our ability to offer free themes such as this one, with the functionality of a premium design. Illdy is an excellent choice for anyone who needs a professional outlet for their digital website. You’re welcome to leave your feedback on our customer support forums in the event of encountering any bugs. Lastly, we have included a concise documentation into the theme files to help you set Illdy up straight away. MedZone is the newest medically specialized Macothemes invention that will blow you away. It is a WordPress theme with a flexible layout and fast performance. It comes with an easy to set up one-page format. One-click demo option is also available! MedZone is ideal for large institutions looking to get ahead into the XXI technological trends. It will help you set up information such as physicians’ expertise, opening hours or appointment booking. It even provides specialized medical icons and pages like admission to a center and contact pages. MedZone has a very clean and clear concept that imitates the ones of health institutions. It is sober and professional, but allows for personalization. It also comes with unlimited Google Fonts for texts and colors for layout design. MedZone is translatable too! Reach patients with language barriers, thanks to its WPML compatibility and po. files. Commercial transactions can be easily set with WooCommerce. All in one! Present your business into the new digital area with this tool! Use MedZone! Ascendant is a multipurpose WordPress theme that is versatile and features premium plug-ins. You will get 3 different versions to suit your needs. Ascendant also comes with a responsive layout to adjust in any scenario. Screens and browsers are not a problem at all. Pages are completely customizable and are unlimited. Ascendant uses Google Fonts for awesome typography and has multiple sidebars. Play with its countless color combinations pallets and use its many custom shortcodes. You will also get WooCommerce compatibility to add shops as you wish. Get this awesome tool right away…Use Ascendant! Regina Lite was originally created as a WordPress theme for the medical industry. Although, Regina users have not hesitated to use the provided template framework for sites related to business, creativity, sports, and general agency services. The extensive customization options make this theme accessible to any kind of a website, given that you’re seeking a template outline that focuses around services, team members, and news announcements. Those are the three areas in which Regina Lite excels the most, thus providing a one of a kind experience for you to create a truly appropriate business website. Lastly, its WooCommerce support lets you open up your own digital store. Expansive is a free one-page WordPress theme that is being frequently utilized by creative artists, photographers, and agencies that focus around portfolio oriented business services. It was designed from the ground up to reflect modern design trends, and include a responsive design functionality that would effortlessly adapt itself towards different types and sizes of devices. The full-screen hero slider is where you can make a lasting impression for those visitors who have come to your website for the first time. And you have lots of ways to use a portfolio grid-layout to outline your achievements, services, and anything else of relevance in those situations. Enclosed was originally a “showcasing” WordPress theme. However, it sits on a One Page design layout, thus making it an accessible choice for your projects where you need a single page design. The uniqueness of Enclosed lies in the boxed layout grid that sits within the full content area of the website itself, making a more “special” kind of feeling. If you are a designer or a painter, you can count on Enclosed to give you the necessary tools for creating a solid portfolio of your work, and any of it that you’d like to sell. Enclosed is packaged with numerous custom page templates, such as contact forms, etc. Transcend is a custom-built WordPress one-page theme from CPOThemes, with the intention for it to be used by professionals and small business owners. It has the necessary components that websites of that kind would require. Starting with a flexible content slider, which isn’t stretched out to take over the whole page, but also the beautifully designed elements for displaying portfolio items and services that your business is providing. Transcend is a mobile-friendly theme, with quite a bit of emphasis being put towards a colorful user experience, so if you like some color variety in your designs, check this theme out! The peeps at Rara Themes know what they’re doing when it comes to one-page WordPress themes, and Business One Page is clear proof for that. This is a modern and clean theme that is of great use for small business websites, digital agencies, corporate businesses, individual freelancers, those who own a portfolio, and even bloggers themselves. One Page’s design is focused around content, whether it’s individual components that display your service offerings, or a full-width testimonial widget. It’s all about putting the content first, so readers can quickly get from point A to point Z. One Page Scroll from HooThemes is a responsive WordPress one-page design crafted using the Bootstrap front-end framework. It’s packed with goodies like Font Awesome and the Options Framework to provide a revolutionary way to change settings on your website design. It’s also remarkably creative, with a unique “side menu” that visitors can minimize, but also things like a music player in the background, and neatly designed content rows for displaying different kinds of items, most notably (as seen in the demo) portfolio items for photographers, graphic designers, and anyone else who wishes to use their website to highlight their work. Onepage (not to be confused with the theme name above) by Iografica is a beautiful WordPress theme for One Page websites and projects. It was recently released to the public, making it fresh and optimized with modern features that we commonly see in popular websites. Onepage embraces things like website performance and search engine optimization, so you don’t even need to think about spending too much time trying to optimize those aspects yourself. It’s mobile-friendly, and it’s plugged into the Live Customizer to give webmasters as much freedom as possible in terms of design customization. The creators of Onepage have put in the work so that the theme supports eCommerce solutions like Easy Digital Downloads, and WooCommerce. Themespade (99colorthemes) is the new kid on the block, hoping to take the free WordPress theme market by a storm. And we have to give these guys credit where it’s due — the PageLine one-page theme is a work of art, and definitely a great contender to be topping off the charts of the most sought after single page theme. The full-width and full-height homepage header ties together with the menu items (which gradually scroll with the user, anyway) and creates a strict professional atmosphere, one that not only small businesses and corporate agencies would enjoy, but also startups and freelance workers who wish to highlight their work as the first thing on the site. The Education sector is all about concise information presentation, and snippets that make the website navigation accessible. Creating an education theme that’s going to be used by many isn’t always an easy task, but the developers at Rara Themes have some sense of what they’re doing. The Education Zone theme for WordPress has an overall smooth design layout, with emphasis on component colors and their appropriate place in the design. The codebase is clean, well commented, and provides any developer out there an opportunity to modify this theme to their own liking, without the extra effort. Amongst unique features and elements, you’ll find custom menus, promotional banners, interactive data counters, custom sections for study courses, testimonials sections, Call-to-Action banners, and ways to present social media information. We can see ourselves paying for this theme if it wasn’t available for free. But since it is, there’s no reason not to get your hands on it. HashOne instantly feels like a WordPress theme for business needs. The creators of this theme recommend that webmasters use this design for sites and projects related to blogging, photography, freelance, graphic design, small business, nonprofits, agency services, and corporate needs. The homepage is divided into sections, and these sections can give you the tools to cover a lot of ground for your business. In no particular order, the sections included in HashOne are: Featured, About Us, Services, Portfolio, Team, Counters, Reviews, Blog, Client Logos, and Call to Action elements. Keep in mind, you can arrange and rearrange these sections in whichever way is most appropriate for your business type. Lastly, HashOne is optimized for SEO, is prepared for WooCommerce, and can easily be translated in other languages. Since there are other themes being built off of this one, we might as well give it an honorable mention. It is built by Themeisle, and it’s commonly referred to as a WordPress one-page theme for business solutions. More than 20,000 blogs are using Llorix One, with great proportion of those blogs being fully operational business ventures, startups, and mobile application owners that require a professional digital presence to promote sales and conversions of their product. The color palette of Llorix One is modern and trend oriented, but easily managed through the WP Live Customizer. Llorix One is compatible with your most favorite plugins, including WooCommerce, bbPress, JetPack, SEO Plugins, and has a global theme design that’s friendly towards search engines. OnePress has ridiculous popularity in the free WordPress theme library. This creative and modern one-page WordPress theme is equipped with features and tools that are suitable for websites related to business, portfolio, freelance, creative agencies, and individual projects, as well as showcase related websites. The in-built theme customization framework shows you just how far the customization options of WordPress have evolved, and how you can, within a single click, change the whole appearance of your site. FameThemes is a well-established brand in the WordPress theme development market, and their themes are always optimized for maximum SEO exposure, as well as optimal website performance, which is a known search engine ranking factor. One Paze from AccessPress Themes is the type of design that instantly leaves a long lasting impression on its visitors. It has a powerful back-end to support features like CSS3 animations, custom menu layouts, full-width content sliders, and interactive Call to Action elements. The menu is initially hidden (can be changed, of course) and both desktop and mobile versions get the Hamburger menu instead. The theme-wide Parallax support creates for some magnificent user experiences, totally worth considering for a business or app launch website. Despite One Paze being a flexible one-page theme, you can always opt for the easy solution and use the 1-click demo installation process to instantly create a fully functional website. OnePirate is going to be a decent choice if you plan to create a very simple One Page WordPress website. That is not to say that OnePirate fails to impress. It still rocks that massive hero slider on the homepage, and it still provides you with numerous ways to enlist your services, and any kind of feedback that your customers might have left. The only thing is that OnePirate focuses around simplicity, so if you’re not expecting millions of visitors to your site and simply need a place on the web where you can publish your portfolio items, this could be a great alternative to use over any other choices we’ve looked at so far. When we think of single (one) page themes, we typically imagine the usual step by step layout, but hardly do we ever think of layouts such as the one being presented by HooThemes in their SinglePage design. This is some truly spectacular creative work at play here, and we wonder what inspired these guys to go the extra mile with delivering such a unique WordPress theme experience. As you will notice in the demo, SinglePage is based on a “slider style” layout, where each section of the website is divided into a full-page slider that can be populated with any kind of components, elements, and content in general. The sections are ideal for portraying applications and general software where you’d want to include video demo’s or interactive product feature previews. Responsive design is pretty important nowadays when various devices are out there. SinglePage theme for WordPress is fully responsive in all mainstream browsers such as Google Chrome, Firefox, IE, etc. and works perfect on mobile devices incuding smartphones, tablet pcs, and so on. Business One is a sought-after theme option for industries like consulting, health, finance, small business, startups, creative agencies, marketing, social media, and multiple others. The modern design with a mobile-friendly layout is what makes Business One so attractive. With thoughtfully designed website sections and components alongside them, the Business One theme puts your content in the spotlight, every single time. The complete documentation will explain how you can customize colors in unlimited varieties, how you can take advantage of hundreds of free fonts from Google Web Fonts, and how to add a digital store option to your business website using WooCommerce. Onetake is a One-Page theme focused on covering as much ground as possible, solely on your homepage alone. Through creative concepts and design understanding, the HooThemes team have come up with a way to neatly organize your business information into a single page, without feeling like you’re overly cramming your website with useless stuff. The things that have made Onetake so appealing and recognized in the community are Bootstrap, Font Awesome, and YouTube. It also has Awesome Slider integrations. You don’t have to do anything, but to plug your content into those individual components and you’re good to go. Onetake looks smooth on mobile and tablet devices, and its codebase is well-documented for both CSS3 and HTML5 parts. The developers of I Am One did not hesitate to include as many homepage sections as possible. In all fairness, it makes sense. For single page themes, it’s crucial that the homepage thoroughly explains what your business venture is all about. Having said that, I Am One is suitable for multiple industry related websites, not just general business. Freelancers, contractors, and even those in the health industry can all take advantage of this theme’s functionality. It’s modern, yet covers components like product pricing, social media streams, portfolio grids, and customer reviews. This enables it to create a fulfilling browsing experience. Onetone is a free WordPress one-page theme with a fully mobile-friendly design. It was developed for websites of business and personal nature. It comes furnished with elegant homepage components, custom shortcodes, full-width sliders, and scrolling Parallax backgrounds for that extra modern feel. Moreover, Onetone isn’t your typical WordPress theme in a sense that it doesn’t feel static. The MageeWP developers have done their best to include as many CSS3 animations in this theme as possible. This further creates a personalized experience for business and agency styles websites. It’s like you’re getting a marketing package as part of the deal. Winsome is a new flagship release from Promenade Themes, a group of developers who aren’t shy about investing a ton of time into perfecting one design. We know that Winsome is going to perform really well, in both Single Page and Multi Page scenarios; there are demo previews available for both styles. Winsome theme options are fully manageable through the Live Customizer, so you can create meaningful design changes in real-time. Winsome includes unique components like data counters of business aspects and custom call to action elements with full-background images. It also has a very unique contact form at the page footer, combined with Google Maps for maximum business exposure. Just brilliant in every single way! Clarina has that fashionable feel to it, but nonetheless focuses around professional design standards, as supported by Bootstrap. It also has section support for Parallax effects. The developers tailored it to suite websites related to business projects, software, startups, and mobile applications. All those use cases, without losing sight of simplicity. The best one page themes for WordPress are those that give the user authority in designing. Clarina is certainly one of those themes. Oh, and it’s based on the Llorix One template that we discussed earlier; so you get all those juicy features from that theme, too! Could it be that themes of this high quality would be released for free? Well, we are just as shocked as you are, but we won’t complain. ParallaxSome is sporting some serious design chops, and typically this sort of quality is reserved only for premium themes. The demo itself is designed in a way that portrays the endless capabilities that the theme is capable of. It also gives you hints and clues as to how you can use this theme. With this, you can use it to create the perfect startup or product website for you. We mentioned product, because of the flexible ways that images can be overlaid with HTML5 elements. This allows you to discuss product features within a single hero element, without losing design space in the process. Eight Sec from 8DegreeThemes is a free WordPress theme with a One Page design layout. It’s commonly used by agencies, bloggers, freelancers, corporate businesses, and those with a huge digital portfolio to present. Eight Sec is based on the Live Customizer, ensuring that you can rapidly make meaningful design changes. You can also select from a Full Width or Boxed layout options, adding further originality to your website. Moreover, you have the optional choice of enabling CSS3-supported sitewide animations. The developers cross-checked this theme for mobile responsiveness, and also for support amongst the most modern web browsers. Plato saw some initial success on its launch day. It still maintains a healthy number of a few hundred downloads every day. There haven’t been any major updates to the Plato theme in the recent months. Still, its design remains a professional solution for anyone needing a stable One Page website design for their WordPress website. Create custom menus, customize colors, rearrange elements, and all that creative jazz. Eleganto is the culmination of every single theme we’ve rounded up so far, packed into one beautiful design package. It’s astonishing how different Eleganto looks from all of the other One Page themes we’ve covered. Also, the fact that that this theme is available for free download makes it even more alluring. Eleganto has two things that make it so unique: its CSS3 animations all across the board, and its very clever use of Parallax to create an authentic user experience. The developers packed it into a nifty user interface. We love the slightly tipped over homepage sections, with enormous amounts of colors and visual additions. This creates an industry-standard website browsing experience. With Eleganto, you can now establish your business, corporation, or agency and create a long-lasting digital presence. Overall, we recommend that you brew up a cup of coffee and experiment with the endless possibilities of Eleganto! The NovelBlue keeps things simple. It has Live Customizer support for easy design modification, and it’s focused around large typography to get the message across. If you are a budding entrepreneur and need a minimal solution for presenting or showcasing your portfolio, then use NovelBlue. NovelBlue is also going to be of great assistance for your needs. Moreover, you don’t even need to have that much experience with WordPress. You can use the Drag and Drop interface to rearrange the homepage in ways that feels most fitting to you. Lastly, it’s totally responsive, and it’s ready to help you sell your products using the WooCommerce store solution. Integral is for the serious businesses who know how to appreciate design features that are self-explanatory for business purposes. This is also the Lite version of the theme. Whereas, the Pro version brings out even more guns to help your business stand out from the crowd. The core strength of the Integral theme is its ability to display varieties of content into a Single Page design. Also, you will never feel that something is missing. With the Bootstrap Framework back-end, you can rest assured that Integral will work flawlessly amongst smart devices and browsing tools. Take a look at the demo, it’s beautiful! NovelLite is the spiritual successor to NovelBlue. In fact, the developers used the core template of NovelBlue to support that theme we saw earlier. They built it around a more “fresh” design scheme. It also includes additional elements like pricing tables, team member displays, and a full-width contact form. If you’re a freelance or a business that plans to sell something online, the NovelLite is fully compatible with WooCommerce. It also has a custom-built designs for product pages and listings. Picking, choosing, and finally deciding on the final theme you’re going to use for your WordPress website isn’t always easy. As flexible as WordPress is, we can sometimes make the mistake of choosing a design too quickly. Later, we realize that we didn’t actually like it and now we have to find something else. With this free one page WordPress themes list, we tried to include as versatile of a selection as humanly possible. Our focus was solely around free single page themes that would support customization and would adapt to custom code changes. We also consider its documentation so that you wouldn’t need to bother the support teams every 5 minutes. Let us know which design you decided on, and why you thought it was the best pick for your website. Sometimes you just need a simple fix. Something bugs you and will confuse your shoppers, but the solution is just not built into the WooCommerce core. Such is the case with the sorting options on your shop page. As I mentioned, a simple fix. The WooCommerce Remove Product Sorting plugin is a free plugin from my friends over at Skyverge. After installation, you will find the options to for the plugin in your customizer. Once there, just click on WooCommerce > Product Catalog and you will see where you can toggle off as many of the default sorting options that you want. As you can see here, it works like a charm. There is another free plugin that gives you the ability to add extra sorting options to your WooCommerce product page for alphabetical, sales, in-stock and reviews as well as changing the default sorting label. You can see that post here. The moment a customer clicks the final purchase of a product on your WooCommerce store, they are gone. But what if you could send them directly to a special landing page? The challenge of running an online store is getting creative in your cross-sells. You might do this via email after a purchase, or directly on the product, cart or checkout page. It could also be done by redirecting them to a special page. This plugin is designed to redirect customers to a Thank You page, but, really, it can send them to any page you choose. As you can see in the settings, it allows you to redirect to either a page on your site or a URL. This is a global setting and would apply to all your products. For a specific product, you could choose that on the product page. It’s that simple. And if you get creative, you’ll find all sorts of ways to use this. Cross-sells – A perfect way to let the customer think about adding some accessories. Especially good with products that have add-ons that are not needed at the moment, but a way to plant the seed in the customer’s head. Extended Warranties – Instead of trying to sell them one during the process, you can send them to a sales page that explains the advantages in more detail. Instructional Videos – A great added bonus. Videos on how to use the product. What others have used it for. An incentive to get them to bookmark the page and return later. Special Sign-Ups – Take it beyond your newsletter and create a special email that they sign up for to keep them in the loop on sales or something else that would encourage them to return. Make it exclusive. Up-Sells – Incentives to extend a subscription or membership. A Deal or Offer – This could be a coupon you offer for a buy one, get one deal. Or perhaps a percentage off their next purchase. This may work better than a follow-up email in some cases. These are just a few ideas of what you can do with this plugin. After someone adds a product to a cart, what if you could have it redirected to checkout, saving the customer time? Or perhaps, you would like to redirect the customer to another landing page that would offer an incentive or cross-sell product from your store. This is another great opportunity to boost your conversions and even cross-sell your products automatically. The WooCommerce Add to Cart Redirect extension gives you four custom options. You will find this in your WooCommerce > General > Settings. Just type in the page you want it redirect to. As with global settings, this will be applied to all the products on your site. Under your Advanced tab, on each specific product, you have the option to redirect to checkout or any other page. You can also redirect to a specific URL. In addition, you have the same options for redirecting a specific variation of a variable product. It has been proven that the quicker someone gets to checkout, the better the conversions. So depending on the product, this is something you might really want to consider. There are so many other ways you could use this. You could set up a product as a cross-sell that potentially would be perfect for the customer to purchase at the same time. Or, if you have some products on sale, redirecting to a product that would enhance what they have already chosen could make for an additional purchase. Lastly, you can get creative and build unique landing pages that might offer more important information on the product or some other bonus or incentive. Whatever you choose to use this for, it’s easy to set up and have running on your shop— instantly. Check out the WooCommerce Add to Cart Redirect to learn more. Why do we buy a WordPress theme? Because we don’t want our site to look like any other WordPress site out there. We want ours to be unique. If that’s the case with themes, then why not with the login page? Using a custom login page is one of the primary ways of providing a unique user experience. It uplifts brand identity, which is crucial for any business to succeed. For blogs or membership sites that require visitors to log in to access content, WordPress’ default login page is the starting point. Before someone can access any subscriber-only material, they need to log in to the site first. Think about it. When you’re about to log in to the “members-only” area of a newly purchased membership site and you see the same old login screen that you’ve seen on every other WordPress site, how does that make you feel? The effect is slightly dampened, if not significantly. That’s why your business needs a customized version of the WordPress login page that’s tailored to the look and feel of your business. If you’re building a membership site, a custom login page is absolutely necessary. If you’re building a custom solution for your clients, then it’s a good idea to white-label the WordPress login page (and preferably the admin area as well). White-labeling your client’s WordPress site uplifts brand identity and works as a marketing agent for inbound traffic. How do we customize the WordPress login page? The easiest way to customize a WordPress login page would be to directly edit the wp-login.php file, which is definitely not a good idea. Why? For starters, it’s considered as a poor software development practice. Secondly, whenever you update a core revision of WordPress, chances are that the file is replaced with a newer version. As a result, you’ll lose all customizations. Another way is to build yourself a nice plugin with all customizations. You can add nifty features like links, buttons, and animations and pack them in the plugin. Once you activate the plugin, the changes are immediately incorporated. This is essentially the correct (and safe) way to execute the same process described earlier. Since it is a plugin we’re talking about, you won’t lose the customization while updating WordPress. Here are a few tutorials to help you achieve this. Keep in mind that implementing these tutorials takes significant time and effort and that you might end up becoming a developer. The third and final methods to customize your login page is the easiest one by far—WordPress plugins. Below are some of the best plugins to customize your WordPress login page. We’ve categorized the plugins under free, freemium, and premium to help speed up your plugin hunt. Keeping in mind the growing list of attacks and vulnerabilities discovered every day, I’ve decided to list only those plugins that are from active developers. Colorlib Login Customizer is by far the most versatile plugin that allow to customize login form for WordPress. It packs all the functionality you will find on premium plugins but in this case you get everything for free. How cool is that? Unlike other plugins, Colorlib Login Customizer allows to do customizations via WordPress Customizer. If you have ever customized or configured any theme, changes are, you are already familiar with its user friendly interface. This plugin lets you customize the WordPress login page by changing the background and text color, font type, font size, etc. You can hide a forgotten password or a registration link (this is useful if you want to disable registration). The plugin also supports Google Analytics and SSL-enabled WordPress sites. Apart from the usual features like CSS customization, adding images, and background customization, BM Custom Login’s templates feature is unique. The developer created a Flickr group where the plugin users share their customized version of the login page. You can create a new design using a PSD file provided on the image template folder of the plugin and then upload the new template to the plugin’s resource folder located at /wp-content/plugins/bm-custom-login/images/. This plugin sports a ton of features, including heavy customization options ranging from background, fonts, animations, colors, opacity, gradients, and other awesome CSS capabilities. It can also change the footer text in the admin dashboard, which is great if you’re building a custom solution for your client. A major feature of this plugin is the settings import/export feature. This just makes things so much easier when you’re managing multiple websites. LoginPress is a convenient login page plugin for WordPress which allows you to customize the style of the layout to the very last detail. Meaning, from colors and images to texts an other whatnot, all is waiting your creative touch. Add a logo, create an enticing background an specify the exact error message that you would like to show your users. Instead of featuring a boring login page, the web design can now fully follow your branding regulations. It will feel like the page is custom-made from scratch. Yes, that powerful and modifiable LoginPress is. On top of that, any changes you make, you can preview instantly. This process ensures a quick creation while still reaching the same professional levels. Last but not least, the design will also be 100% responsive, compatible with web browsers and high performing. No slowing down of your website’s loading speed. Thanks to convenient tools like Login Designer, you can build stunning web designs without the need to know how to code. Login Designer is a killer login page customizer plugin that gives you all the rights to craft the niftiest login pages out there. It will not be just easy and quick, but you will also have a lot of fun during the process. With Login Designer, you do the programming work visually. And this makes the extension beginner-friendly, yet perfect for advanced users as well. You can save yourself loads of time and effort by choosing from predefined templates and go from there. You can improve the ready-made layouts further by changing colors, images and other details. Due to the ease of use, it will feel very comfortable working with Login Designer, almost like you used it already. In barely any time, you can create a fully customized login page with the amazing Custom Login Page by SeedProd plugin. Instead of using the default layout, feel free to spice things up and modify it accordingly. It will take you only minutes time and you can have a refreshing login page live already. When you gain access to the right components, your life becomes a whole lot simpler. It is like you would take a smart shortcut that will take you to a successful creation of a professional web design in a snap. With Custom Login Page by SeedProd, you can customize almost everything. From logo and background image and color to button color, text color, typography and font size. With the advantageous editor, it will be a breeze making the exact login page that you would like to add to your existing online presence. Custom Login Page Customizer is a multi-functional login page plugin for WordPress. From admin and client logins to forgot password forms and pages, you can create all of them without breaking a single drop of sweat. What’s cool, you can use Custom Login Page Customizer and enhance the layout straight from the WordPress’ integrated customizer. That said, you can preview your tweaks and modifications right away, without the need to open a new page. Custom Login Page Customizer aka Arrow login page plugin is 100% customizable. Feel free to take it to your full advantage and make the most out of it. Of course, the tool is also effortless to use to make sure beginner users can reach professional levels with ease. To get the gist of it, make sure you first watch the video introduction and see how simple it is to use Custom Login Page Customizer plugin. This is another awesome multilingual plugin to customize your WordPress login page easily. It is responsive in design and supports a ton of customization features, along with a live preview within the settings screen. A unique feature of this plugin is the animated background. Set a couple of images, and watch the plugin generate an awesome animated slideshow. You can add your social media accounts with one click. Also, all the options are fully customizable. This plugin has essentially the same features as the previous one. The only benefit is that it has a text box to include the custom CSS. These plugins offer basic functionalities for free and charge for the advanced ones. Normally, these plugins have a lot of active users and are mostly updated since they have a higher number of active users. This is one of the most popular freemium plugins with over 80,000 active installations. The free version includes tons of design features, along with custom CSS and JS code snippets. Extensions, such as stealth login and custom redirects, are housed under the premium tag. All the customization features are available in the free version. The premium version provides a reCAPTCHA verification module as a security addon. This plugin has over 9,000 active installations. Unfortunately, it hides a lot of its advanced CSS features under the premium tag. If CSS isn’t your strong suite but you’re looking to style your login page anyhow, this plugin might just be for you. On a developer’s side note, this plugin is also compatible with any other that hooks in the login form, including BuddyPress, bbPress, and Limit Login Attempts. Simply put, this plugin is a complete solution for white-labeling your WordPress site. Also, this plugin has over 4,600+ sales and has a rating of 4.66 out of 5. If you would truly like to take your login page to the next level, all you need is WP Admin White Label Login. This practical customize login page plugin is packed with an enormous collection of features and components. It even includes over 25 ready-to-use templates which you can employ out of the box. Of course, it will take you little time and energy to customize the desired layout to suit your branding regulations to a T. And WP Admin White Label Login ensures a codeless experience, too. Meaning, even if you lack programming and designing knowledge, you will still make a killer login page with it. Other features of WP Admin White Label Login are image and video backgrounds, Google reCAPTCHA, social logins and an option to translate it to any language you want. The end layout will also be mobile-ready and in tune with all modern web browsers. For extra assistance, you can always hit up the amazing and friendly support. Developed by iThemes, this plugin comes as part of the iThemes Plugin Developer Suite, which costs $247. What technique do you prefer to customize your WordPress login page? Would you prefer to build a plugin yourself or use an existing one? If your answer is option 1, we’d love to check out your work. If it’s option 2, what’s your preferred plugin? Do you have an online store? Do you offer any services online? Are you looking to increase the number of members subscribing to your service? Then, you must have heard of landing pages. If you haven’t, it is time to familiarize yourself with them. Read on to find out more about how to make landing pages an important part of your marketing strategy. A landing page is intended for information and brand building. For specific campaigns, you will need specific landing pages. This is the place where you can capture a lead and convert it into profit. A landing page is a single webpage that has one special objective—to get your visitor to do something you want. Every bit of content on this page is geared to interest the visitor to take a particular course of action. The objectives may be anything—filling in subscription forms, providing contact details, purchasing a product, introducing a friend, or reading up on further details about the company or product. You can add some kind of incentive for them, perhaps freebies. The best landing pages are built with specific intended purposes in mind. They have structures that should be maintained with subtle differences according to the particular needs of individual websites. To make landing pages a success, the marketing team should undertake a load of off-page optimization as well. The team should be able to get traffic to the landing pages. This is critical to the success of the marketing campaign. Once a visitor reaches a landing page, the page will do the rest of the job for you. convey the exact information that the visitor is searching for. be completely in sync with your marketing strategy. preferably be completely separated from your website. preferably not contain any menu as you do not want your visitor to wander away. carry content that is almost exactly the same as that used in any advertising campaign so that it will be found easily by search engines without being directed to the homepage. Some things that a landing page should not miss out on are a catchy headline, a tagline that elaborates the headline, a really good image that captures the essence of your campaign, the benefits of your offer, and a call to action. If you are a serious marketer, you should read up further on this page on Unbounce. Moreover, landing pages can be of the click-through variety, where visitors click through one page after another till they reach the shopping cart. They can also be used to simply gather the contact details of visitors, creating sales leads that can be used later. Now that you have an idea about what landing pages are and what they should contain, your next concern will be how to create a landing page. You can get help from service providers, or you can use plugins to create landing pages. Using plugins is a less costly affair and you have complete control over your landing page. Here are some quality plugins that can create beautiful and effective landing pages for WordPress. WordPress Landing Pages from Inbound Now is a free plugin that will help to create landing pages for your WordPress site. Inbound Now is an expert in online marketing, and this plugin is in keeping with their best marketing practices. Create multiple landing pages for your WordPress site. Once installed, locate the plugin’s menu in the WordPress dashboard and manage content from there. It gives you the option to connect your landing page with other apps like MailChimp and Aweber. The plugin offers a number of pre-made templates, but they are a little basic, and you will find that you need to customize them. Customization is possible with the Visual Editor, and you can make changes and view them before saving. With this plugin, monitor conversions as they happen and optimize for conversion on a continuous basis. Make an identical copy of a page, vary it, and run A/B split tests on the copy. See different versions to check out which one converts the best. Forms can be partially filled so that a visitor will find it easier to complete them. It is compatible with WordPress Leads and WordPress Calls to Action. Together, these plugins will help to track visitor activity and will capture leads. It is also compatible with many third-party add-ons, free and paid. You will find that you need premium add-ons to integrate this plugin with your email marketing platform and the autoresponders, and you will have to pay on a per provider basis. Any contact form—Gravity, Ninja, or Contact Form 7—can be used with this plugin. You can sign up for a premium account with Inbound Now, which starts at $99.99 for a single site and runs up to $249.99 for multiple sites. This gives you unlimited access to all their marketing plugins and landing page templates. Thrive Landing Pages is a premium plugin that is a good value for money. It is 100% conversion-optimized and looks perfect with whatever theme you use. You can choose from the 122 different templates and retain the layouts just as they are or change anything on the page any way you like. The sequence of landing pages that work well together or landing page sets are available. Using the intuitive front-end Thrive Content Builder, you can completely overhaul any template. More importantly, you can see your own template take shape even as you drag and drop without refreshing or without switching from the editor tab to the preview tab. You will see your page just as your visitor will see it. The plugin allows a high degree of customization, and you can edit text, images, change backgrounds, and add videos. Countdown timers with specified end dates can be set. As if this were not enough, you can use codes provided to design an entire template library of your own. A two-step opt-in process is available. In the first, you click on a button, and this leads you to the second step where you can fill up the form. This ensures a greater conversion rate. A number of content elements, such as content boxes, styled lists, guarantee forms and many more, have been included, and you can add them as you like. To install and activate this plugin on one site, it will cost you $67. For multiple sites, it’s $97, and for a developer to install it on a client’s website, it’s $49 per month paid annually. OptimizePress is both a theme and plugin, as it comes in both modes. Those who are happy with their current theme should stick to it and use the plugin mode. But for those who intend to set up a marketing website, the theme may be a better option. This plugin will help to establish, grow and convert an online audience. It does not merely help in building landing pages, but can help to secure content for subscription members, create sales or marketing pages or operate authority blog sites. This plugin is designed for WordPress and there will be no WordPress – plugin conflict. You can choose from 30 different templates and adopt them as your own. Or you can customize it with the help of the Visual Editor. Editing can be done from the frontend and you can see the changes even as you make them. With the help of the Element Browser, you can choose from 40 different content elements and include them in your template. No coding is required at all. This tool is developed on the principle that the appearance of your website counts for everything and that being responsive is no longer an option. The landing pages can size down instantly to hand held devices. The plugin can integrate at the API level with Aweber, MailChimp, GetResponse, iContact, Office Autopilot, Infusionsoft and 1Shopping Cart. You can purchase the plugin with a one-time payment of $97 for the core package, which is for three sites that you own and operate. The publisher package for 10 sites costs $197. Lastly, the pro package for 30 sites costs $297. The purchase also entitles you to a year of free support and updates. If you are not satisfied, you can avail the 30-day money-back guarantee. You cannot truly call Leadpages a plugin. It is more a landing page creating platform. It includes powerful features like LeadPages, Lead Boxes, Lead Digits, Lead Links, A/B Split Testing, Analytics and Template Importer. 70 pre-made templates ensure that you do not feel lost and will help you find a starting point for your project. Customizing a page is totally intuitive. Embed videos and drag and drop any content element as you like. You can hide all the elements that you do not want to use. And with Template Importer, you can import any template that you like. LeadPages can collect leads from web pages, emails, social media and text messages. Publishing your lead pages is also quite easy. You can publish to your own server, your WordPress site or your Facebook account. You can covert existing webpages or websites into lead generating pages with the help of Lead Boxes. Lead boxes are pop-up boxes that open up when a visitor clicks on a predetermined link or button. You can set any trigger for the pop-up. They contain forms that are integrated with your email service provider. With Lead Digits, you can capture the emails and phone numbers of potential customers when they send a unique text to a specified number. You automatically add these details to the list that you create with your email service provider. Lead Links will help subscribers or readers opt into a list simply by clicking on appropriate buttons. Some additional features like one click Facebook registration, pre-populating the landing page fields and sorting landing pages by conversion rate, make this plugin more attractive to purchase and use. You can purchase LeadPages Standard package suitable for home businesses and entrepreneurs for $25 per month paid annually. The Pro Package suitable for professional websites will cost $49 per month paid annually and the Advanced Package is suitable for marketing teams and agencies at $199 per month paid annually. The plugin offers a 30-day money-back guarantee. Regardless of the marketing campaign, you plan to launch, you can create the niftiest landing pages with Unbounce. This insanely easy to use tool is full of quality features to ensure building fully active custom layouts which you can effortlessly publish on your existing WordPress page. Needless to say, you can customize the web designs and make them follow your regulations and requirements precisely. Of course, Unbounce is also a fantastic plugin to create different variations of landing pages and split-test them against each other. Some of the excellent features of Unbounce are over eighty free ready-made templates, mobile and desktop layouts, MailChimp compatibility, event tracking and Google Analytics tagging. It will be a breeze connecting Unbounce to your WordPress website with this plugin and have your marketing funnels under total control. If you ever browsed for a WordPress theme, there is a good chance you already noticed Elementor mentioned. It is a spectacular drag and drop builder with outstanding flexibility and extendability. Making landing pages and any other custom web design happens quickly without the need to invest too much time and effort. Indeed, there is no need to know how to code to be able to work with Elementor. The tool guarantees a codeless experience developing the much-needed landing pages. All the layouts you will put together with Elementor will be mobile-ready, cross-browser compatible and optimized for fast loading speed. What’s also cool about Elementor is the real-time editing feature. In other words, the very moment you make a change, the result appears right in front of your eyes. No need to be jumping back and forth from back-end to front-end. Beaver Builder is not just a cool name for a landing page plugin; it is also a name of one of the best page builders out there. It has it all at the tip of your fingers, ready for you to employ and take to your advantage. With Beaver Builder, you can hammer out the most striking and high performing landing pages that will boost your conversion rate through the roof. Of course, there is some testing involved before you want to see the results you would like to attain with your business. However, testing, creating and launching new layout variations is super fun with Beaver Builder. If you are on the hunt for a quick and simple solution to creating landing pages, Landing Page Cat plugin is a fine tool to consider using. With the available content, Landing Page Cat ensures that your final creations are conversion focused. After all, aren’t we building landing pages to get more leads and test different variations of existing layouts for continuous improvements? The answer is obvious. To save you time figuring out how to start with Landing Page Cat plugin, watch the step-by-step video tutorial and get the gist of it. First, there is no need to know how to code. And second, it is way simpler than you think. Yes, that is pretty much it. Go ahead, download the landing page plugin for WordPress now and start playing around with all sorts of different features it has available. Another top of the class plugin for landing pages is InstaBuilder. It offers 100 templates for you to choose from and allows you to customize them with the built in image editor. You can drag and drop any element into the page. Also, you can build six types of pages: sales pages, download pages, webinar pages, landing pages, launch pages, and coming soon pages. InstaBuilder has a ready to use library of graphics, icons and images. If you wish, you can add your own custom images and can resize or crop them, eliminating the need for photoshop. The Coming Soon page can capture pre-launch leads until the launch date. Customizable countdown timer can add a sense of urgency. Split testing is possible, and you can choose the best combination for your landing page by testing various versions. Advanced analytics will help you to keep track of how your landing pages are converting. Optimize the landing pages for search engines, and you can customize SEO settings or even turn them off for private messages like Thank You notes. You can time-delay content. Display any content at any time on the page. A redirect option is available for those leaving the page without completing a sale. Use lockable content and opt-in firewalls for sharing specified content with specified subscribers. You can also lock one page, many pages, or all of them as desired. Build a mailing list using the two-step and three-step opt-in technology. This is suitable when you want to streamline subscriptions, such as offering educational courses to qualified candidates only. Purchase the InstaBuilder for a one-time payment of $77 for use on three sites. For unlimited number of sites, you will have to pay $97 and for a developer’s license, the cost goes up to $197. You can also take comfort from the 60-day money back guarantee that is available for this plugin. Coming Soon and Maintenance Pages are actually a kind of Landing Page. These pages collect leads while the site is under construction or maintenance or preceding a launch. 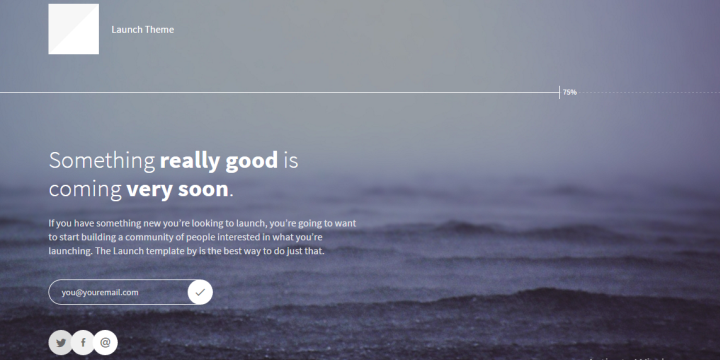 Coming Soon Page by SeedProd is ideal for launching a site. The landing page, email opt-in form, and social media links will help to create buzz around the new site. Add a countdown element, and auto-launch the website at a preset date and time. You can also show the Coming Soon Page for some webpages or for the whole site. This means it is possible to launch your website in parts, as and when they become ready. With Seed Prod you can set use the pre-made themes or use your own. With the default theme and customization options, you can design and publish your Coming Soon page in minutes. Developers can use code to customize. The backgrounds need not be boring. You can add full screen images, slideshows, or a video background. Google Fonts and Typekit access means you can have beautiful fonts handy to build your pages. Animation effects are also available. It integrates with major email marketing platforms, the major ones like Aweber and MailChimp included. If you want some users to bypass the Coming Soon page and gain access to webpages, you can do so by giving them a bypass link. You can also allow them to bypass using IP address or WordPress roles. Store emails in WordPress directly and export them to any service provider. Referral tracking is possible to incentivize sharing. A free version with reduced features is available. But to take full advantage of this plugin, you will have to buy a license. The All Access License comes at $199 for use on unlimited sites and lifetime support. A Developer License costs $79 for use on unlimited sites and one year of support. A Business License at $49 will entitle you to use on five sites and a Personal License at $29 will entitle you for use on just one site. A 30-day money-back guarantee is available, too. Ultimate Landing Page is a free plugin that will help you to create landing pages and coming soon pages and to publish them in minutes. You can publish them immediately or delay their publication according to a schedule. The plugin will also help you to create sales pages, and if you wish, you can set your landing page as your homepage. The plugin includes a collection of templates, all of which are customizable. The page builder will support your imagination in designing and building the page. You will see a marked uptick in conversion rates with this plugin. With split testing, you can be sure about which template or variant you want to publish. The integrated features include SEO metabox, MailChimp, Gravity Form, Contact Form 7, and Ninja Form. Send the leads captured on your landing page directly to MailChimp. You can also add custom forms using HTML. This plugin is not exactly rich in features, but it loads fast and customization is easy. To publish effective, conversion-ready landing pages real fast, Instapage is a good choice. Build a page within Instapage, and push it to your WordPress site where you can publish it as a subdirectory. Run split tests first, and find out which is the best version to publish. The plugin contains a log that the authors can access to detect any issues with it. This feature is off by default and will be available only at your request. Choose from 100+ templates under categories for landing pages, click-through pages, mobile apps, webinars, and thank you pages. Another advantage is the plugin’s integration with 20+ email service providers. The plugin is responsive, and includes automated marketing, analytics and SEO friendly features. Instapage offers a 30 day free trial. The Basic Package costs $29 per month, the Professional $55 per month and the Premium $79 per month. These rates are applicable when paid annually. WP ProfitBuilder has a huge library of premade templates for you to choose from, with many templates being added on an ongoing basis. The customizable templates are suitable for landing pages, sales, and marketing. The plugin optimizes the pages for mobile devices and for search engines. It provides integration with leading email providers, payment processors, membership systems, and webinar systems. A license for personal use on one website will cost you $47, and one for use on 10 websites will cost $67. WP ProfitBuilder is available at discounted prices for unlimited use on client and personal sites at $67.67. A 60-day free trial is also available. Before you rush to buy a plugin, you should check out whether the theme you are using will help you to build custom landing pages. Many themes offer this option as part of their standard features. If it serves your need sufficiently, you need look no further. Plugins provide great benefit to campaign-oriented programs and help to spike conversion rates. Now, that we have checked out the features of a number of plugins, which is that one that you will pick? Keeping in mind that most of the features are common to all plugins with not much to distinguish between them, value for money should be the basis of your choice. If you have any particular requirement, you may pick that plugin which best suits that requirement. If you want a free plugin WordPress Landing Pages is a good choice. To make available a load a free downloads to your subscribers, LeadPages may fit the bill. If you are launching a website, Seed Prod is the one for you. Ultimate Landing Page may be the best if you are looking for lesser number of features with faster load times. To have your products, especially digital products, displayed to advantage, may be you should look closely at Parallax Gravity. If speed combined with great looking content is what you are looking for pick Thrive Landing Pages and Content Builder. Add that to the list building capability, choice of templates, scaling for mobiles, and drag and drop feature, and Thrive Landing Pages and Content Builder will be my pick. I would be glad to learn from your experience with landing page plugins, so please leave a comment below about your experience.